I like illustrating characters, icons, and other highly representative illustrations. I do this kind of work the majority of time in Illustrator, so it’s nice to break out and create abstract backgrounds. Abstract backgrounds are easy to create in Illustrator with a couple of simple techniques. Using Gradient Meshes, Steps Blends and Opacity Masks you can quickly create an abstract background. This is the technique that I find to produce the quickest results but has great potential for exploration. First, draw a rectangle with the Rectangle Tool (m). I start with a deep violet for the color, but use any color you like. 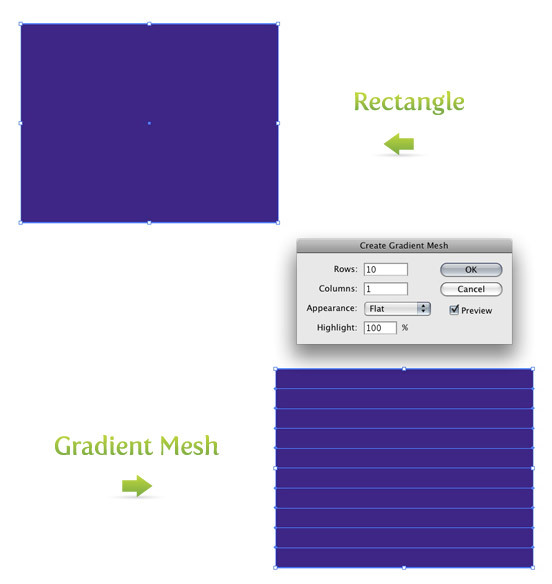 Next, go Object > Create Gradient Mesh to bring up the Gradient Mesh dialog. In the dialog, change Rows to 10 and Columns to 1. Press Ok, and now the rectangle has ten rows separated by 11 Mesh Points on the left and right side of the rectangle. With all these Mesh Points created, we can start added some different colors. 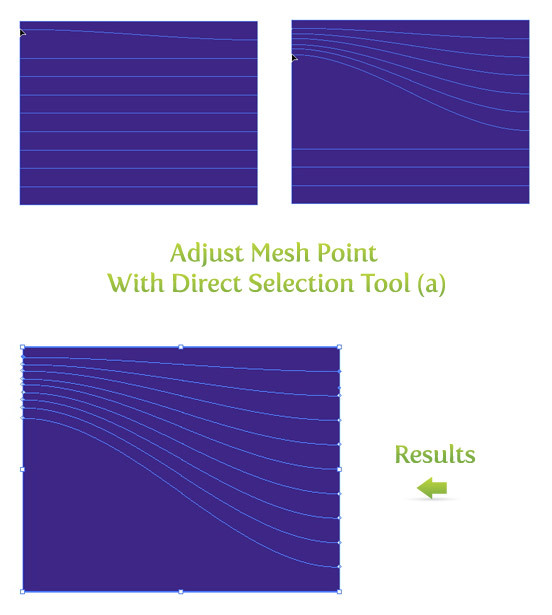 With the Direct Selection Tool (a) select the third Mesh Point from the bottom on the right side of the rectangle. With the Mesh Point selected, change the color in the Color Panel. I like using a lighter version of the background color, but again, use whatever color you want. Next, I skip the next Mesh Point above and select the following one. Change the color, and repeat until you filled all the mesh points. This is the most basic example of using Gradient Meshes. If you want to add more Mesh Points, use the Gradient Mesh Tool (u). With this tool you can add Mesh Points anywhere on the artwork or on any non-compound objects. In the example below, I used the Gradient Mesh Tool (u) and added points on the left side of the rectangle, changed the color, added a point in the middle of one of the lines, and changed that color. 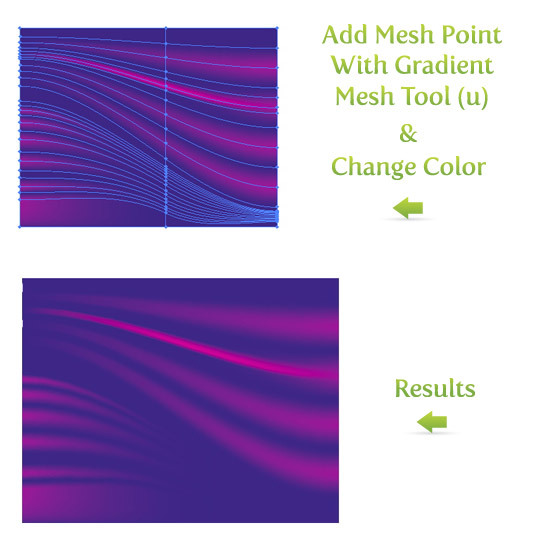 You can easily get lost in moving Mesh Points and changing colors in Gradient Meshes. Play around and see what you get! 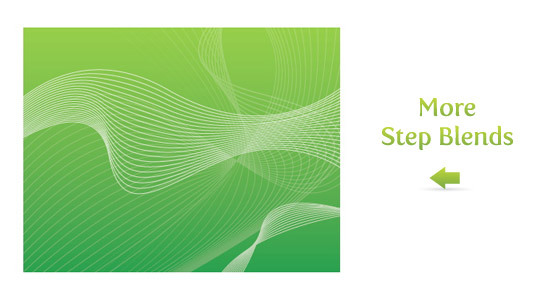 Step Blends are another quick way to create an abstract background. 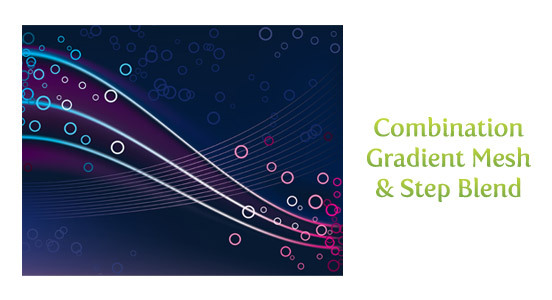 You might have used Gradient Blends previously but maybe not Step Blends. Again, start out with a rectangle, but this time make it a Linear Gradient (>). For the gradient I will use a dark and light green and adjust the gradient with the Gradient Tool (g), so the dark part of the gradient is at the bottom of the rectangle. Next, use the Pen Tool (p) to draw a couple of lines. Draw the first line as a simple Bézier curve. 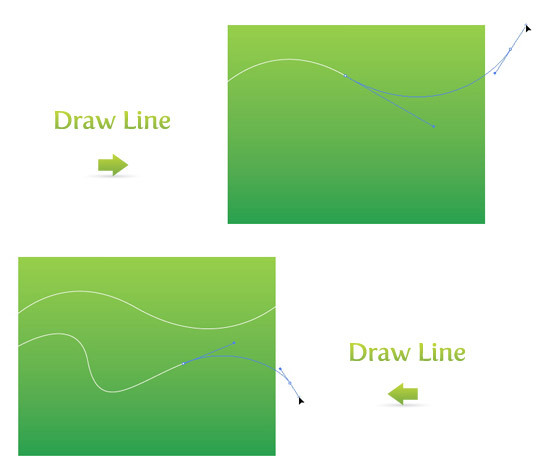 Use the Pen Tool (p) to draw the second line, but this time,vary the curves in the line. 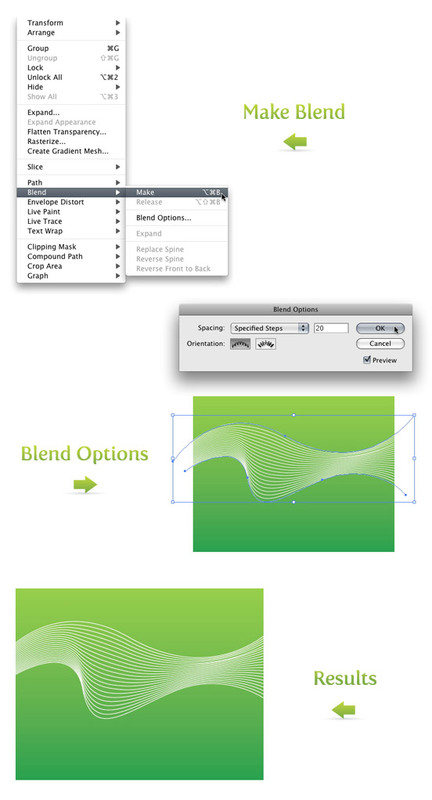 Select both lines and go Object > Blend > Make (⌘ alt/option b) to create a blend. Next go back to Object > Blend Options to bring up the Blend Options dialog. Pick Specified Steps under the Spacing drop-down menu. Depending on how your lines are spaced, pick a number that looks the best. It is a good idea to click Preview so you can see how it will look before you press Ok. You can always go back and change the number of steps if you don’t like how it looks. Just go back to Object > Blend Options to bring up the Blend Options dialog. Combine more Step Blends to create different and more abstract results. This is a fun place to experiment with transparencies and different colors. In the previous tutorial Quick Reflections I talked about using Opacity Masks to create reflections. At the bottom of the tutorial I gave an example of experimenting with Opacity Masks. 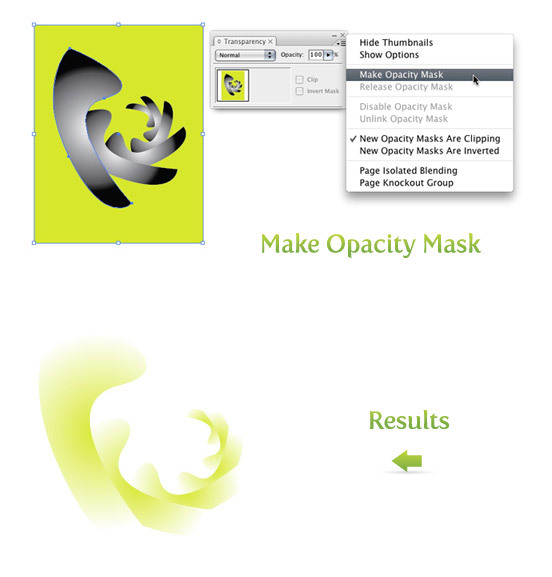 Next, I will talk about creating abstracts with Opacity Masks like in the experiment of the Quick Reflections tutorial. First draw a shape with your tool of choice. I drew a shape quickly with the Pen Tool (p). Next, go Effect > Distort and Transform > Transform to bring up the Transform Effect dialog. Below are the settings I used, but feel free to tweak the setting depending on your shape and how it looks. The rest of the options can stay the same and press Ok. You can always go back and edit the effect. 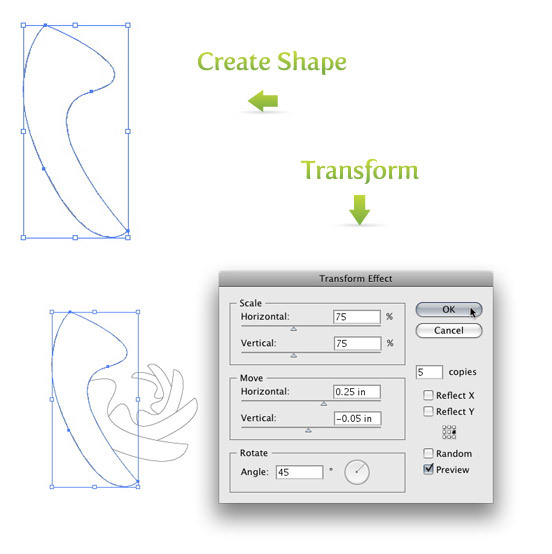 In the Appearance Panel, you will see Transform in the list when the transformed shape is selected. If you double click Transform, it will bring up the Transform Effect dialog with the current settings, which you can edit. Once you have the effect the way you like, go Object > Expand Appearance. If you don’t expand the effect, the next time you try to rotate it, you might get some undesired results. 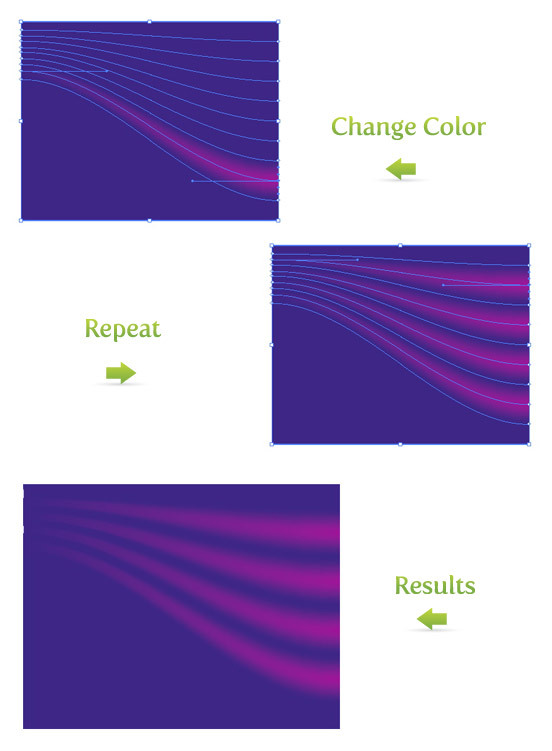 With the shape still selected, create a Radial Gradient from the Gradient Panel. 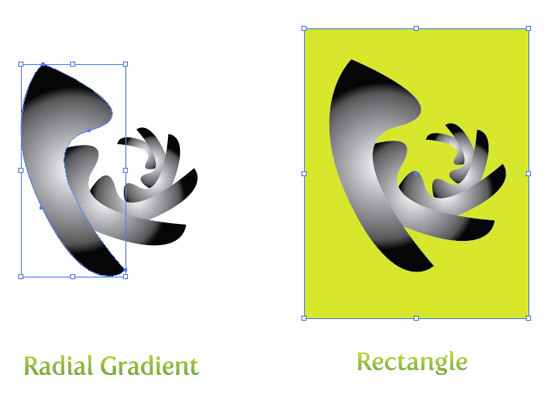 Keep the swatches of the gradient the default Black and White and take off the stroke if there is one. Next, draw a rectangle with the Rectangle Tool (m) that encompasses the transformed shapes. Take off the stroke, fill it with a color and send the rectangle to the back (⌘ shift ] ). Next, select the rectangle and transformed shapes and select Make Opacity Mask from the pop-up menu of the Transparency Panel. Now you have some abstract art! You can stop here if you like or you can take it further. Copy (c) , Paste In Front (f), scale and rotate the artwork to get some different results. 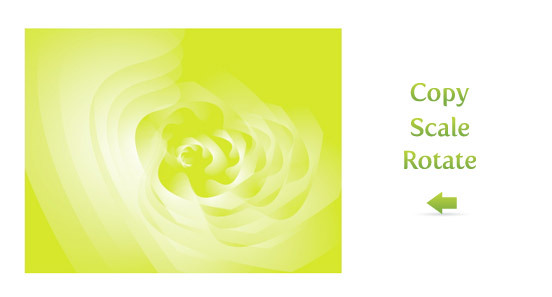 In the example below I created a background with a green color, changed the abstract to white, copied and scaled, and rotated a copies of the abstract. If you want to further edit the Opacity Mask refer to the Quick Reflection tutorial. Combine some of the techniques to get different results. Abstracts are the perfect place to experiment because it is abstract! Thank you, its a great read. Just a quick question I have, is it possible to create such designs using adobe photoshop as well? or only illustrator is suitable for this job? Great tutorial. I once did abstract background like yours in this tutorial. It´s really fun to use the blend tool in Illustrator! Great tutorial, to create nice background! Thanks! Great Stuff. Thank you for these tutorials on the gradient mesh and the blend tool. We can create great designs now! I would like to thank you for these tutorials on the gradient mesh and the blend tool. Both have opened my eyes to create artistic and outstanding designs! thanks a lot, nice tuts. I am no longer sure the place you are getting your info, but great topic. I needs to spend some time studying much more or understanding more. Thanks for wonderful information I used to be searching for this information for my mission. I don’t even know the way I stopped up here, however I believed this publish was great. I do not recognise who you are but certainly you are going to a well-known blogger for those who are not already. Cheers! Most helpful my art works. thanks for the tutorial, this looks amazing, can this be done in Photoshop? Really very helpful tutorial. I do lot of practice & created more effects. Thank you very much for such turorials. If you print this professionally, will you get banding on those gradients or is this just for web? I did it but how do I save it to wallpaper format? Wonderful, fast and effective tutorial. By far the best I have come across in terms of crispiness!! Thanks. Can we have more please?? Wow! Thanks for the excellent tips. Going to apply to my website. Hey Ryan, your tutes are so well put together! Very generous of you to share your knowledge. This tute is particularly awesome…THANKS! Very nice tut for a n00b like me, many thx, cheers. I absoulutely appreciate you showing me how to do this very Interesting! Very cool color combos cant wait to try this. Nice tutorial.. it help me.. thank you.. Excellent tutorial. Quick, easy to follow, effective, and lots of room for experimentation. Helped me turn out a last-minute project in very short order. Keep up the good work! Great tutorial! I am just learning Illustrator and these are some very handy tools to know. great tut!! easy to understand and to follow!! thx alot! the REALEASE of the mesh, which then makes it possible to change the color of the different mesh points. Thanks For the TUTORIAL- GREAT ONE FOR LEARNING!!! one thing i couldn’t do is color the mesh point after the change color phase. could you figure this out for me?? Thanks for this. really lovely. Not sure. I will have to try it out. Hey can u make those backgrounds with pictures and then add effects 2 them??? hey! its great im proud to find this site! lova ya! wow, this site is really great. this mesh tool tutorial was the first one i have ever made in illustrator. but i had a few problems concerning the tools usage. i can’t adjust the mesh points with the direct selection tool. i have to use the mesh tool. additionally i cannot hold the shift bar while moving the mesh point. then it automatically snaps to a point fixed in the grid. but i don’t know how to change it in the preferences. it’s not the option “snap to grid” etc. muchas gracias, Ive been trying to find out about lines and opacity mask y this is the best tut I found. that’s good tut for me, thank you very much. It is Fertigo a free font! Hi, i just want to know which typeface r u using in the buttons and labels of your page. I like it very much. just starting out with illustrator and this is great. wow, very great tutorial! I like it a lot. Many thanks! Another useful tutorial. Thanks for sharing! Make sure you are moving the Point with the Direct Selection tool. It sounds like you still have the Mesh Tool selected, that would create more points. Let me know if that worked. hey!!! its a gr8 tutorial. when i was trying to do i am kind a stuck in colors mesh wont let me add colors in it. can anybody please tell me how to sort this thng. Thanks, this was really really useful! really nice one ;o) this is just perfect site! Well done! These are very helpful tips. I’ve subscribed in RSS. Also, if you have a moment, check out my blog: http://www.willsherwood.com. I’d like your opinion. When you have a point selected with the Direct Selection Tool it won’t let you change? What happens? Just nothing? I’ve being trying to do the color thing but I have the same problem! I’ve selected the mesh point and change the color of the line and the rectangle and do nothing. You have to install Adobe Illustrator. You can learn more at their website http://www.adobe.com/products/illustrator/. Let me know if that helps. Hey, that’s very interessting but how do i get this. Do i have to install it or something ? Thanks! it’s very nice and useful! I will try them! Wow… nice tut! I do these types of backgrounds on a regular basis. You’ve raised some techniques that I have not tried. Bravo.